The data shows a significant rise in reported assaults on the previous quarter, with young Black African men being most at risk of physical racist attacks. ENAR recognises that the government is primarily responsible for the legislative and policy framework within which the force operate. 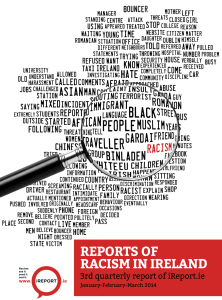 The absence of a National Action Plan since 2008 and the failure of existing legislation to provide clear and comprehensive guidelines to An Garda Siochana is the primary barrier to effectively and positively challenging racism in Ireland today. * Increase in violent incidents. * Rate of reporting to police increased. 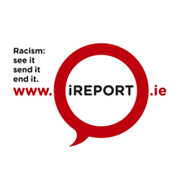 iReport.ie and the iReport are managed by ENAR Ireland, which coordinates a network of 44 trade union and other civil society organisations in Ireland working in anti-racism. ENAR Ireland is the Irish Coordination of ENAR, the European Network Against Racism. ENAR Ireland and ENAR work to coordinate common civil society led responses to racism and racial discrimination at a local, national and European level. ENAR Ireland used to be called INAR, the Irish Network Against Racism. To ensure the analysis of the iReport reporting system is in line with robust international standards of data collection and analysis ENAR Ireland has partnered with Dr Lucy Michael, Lecturer in Criminology at the University of Hull. Dr Michael is an authority on hate crime recording systems and on the impact of hate crimes on communities. She is the author of several works in the area including ‘Hate Crimes against Students’ (2013) and ‘Securing civic relations in the multicultural city’ (2009). She is a member of the British Society of Criminology and an Executive Committee member of the Sociological Association of Ireland.